Members of the association La Belle Etoile, who have been serving ‘exiles’ one hot meal a day at lunch time for 10 years, decided to dissolve their partnership and to stop their food distributions as of the 1st March 2013. “Our departure is not an act of renunciation but a militant act and we remain militant in the soul. We will continue our struggle acting differently, in an other level for the fundamental right to defend people. Volunteers are not here to occupy migrant people, to show them around, distract them and somehow to maintain social peace. 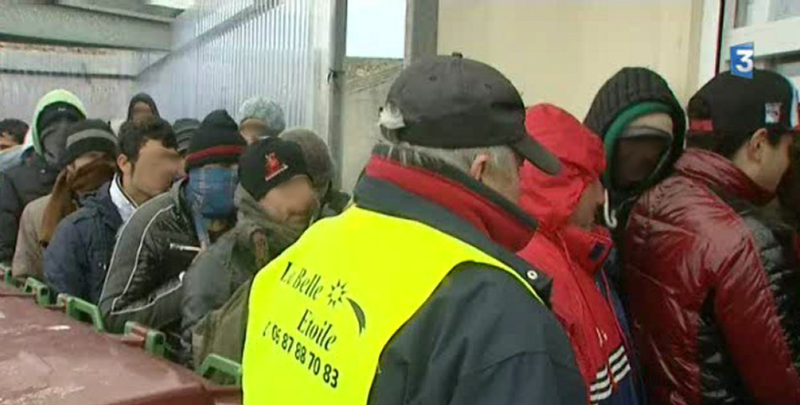 A few years ago, La Belle Etoile had already tried to put pressure on the authorities by stopping the food distribution. The reaction by the mayor and Salam (another association who provide evening meals) was to create another association, Auberge Des Migrants, and the action of the Belle Etoile had been for nothing. This time Salam no longer follows the Belle Etoile. But there are talks amongst other associations whether they can fill in some of the gaps for the food distribution. The municipality has as yet not given any statement. The lunch meal Belle Etiole provided will be missed for sure. But perhaps we can find a solution to allow migrants to cook themselves, organize themselves in groups to eat, as they organize themselves to survive in this city. Noise demo outside Calais’ immigration prison!